The United States will cut off aid to Egypt in the wake of the July coup and the turmoil that has followed, says U.S. official. The United States will cut off aid to Egypt in the wake of the July coup against President Mohammed Morsi and the turmoil that has followed, a U.S. official told CNN on Tuesday. The official, speaking on condition of anonymity, said the full suspension has been prompted by an "accumulation of events," including recent violence against protesters, dozens of whom were killed over the weekend. The suspension will formally take effect in the coming days, the official said. The United States has not yet notified the Egyptians of the decision to cut off military aid, a senior official told CNN. The announcement is not expected to be made on Wednesday and has already been pushed back a few times, the official said. The administration subsequently denied the report. "The reports that we are halting all military assistance to Egypt are false," National Security Council spokesperson Caitlin Hayden said. "We will announce the future of our assistance relationship with Egypt in the coming days, but as the president made clear at UNGA (the United Nations General Assembly meeting in New York), that assistance relationship will continue." Up until now, the U.S. has never qualified Morsi’s ouster as a "coup" and has been cautious about doing so, choosing only to condemn the violence in the country. Washington did, however, cancel military exercises with Cairo and delayed the delivery of military shipments to Egypt, including F-16s. Under U.S. law, a country in which a military coup has taken place cannot receive military aid from the U.S.
Republican Senators John McCain and Lindsey Graham have called on the Obama administration to cut off the aid the U.S. provides to Egypt. 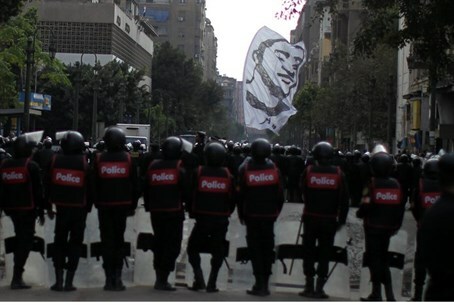 “We find it hard to describe the situation in Egypt any other way. Congress should review this law to determine whether it serves our national interests, but at this time we believe the United States must suspend assistance to Egypt,” wrote the two senators. “This is a difficult decision, but if we expect Egypt and other countries to abide by their laws, then we must abide by ours.